Show us your Stash…. Lizzy! It’s Wednesday – again – which means time for another instalment of Stash Reveals! 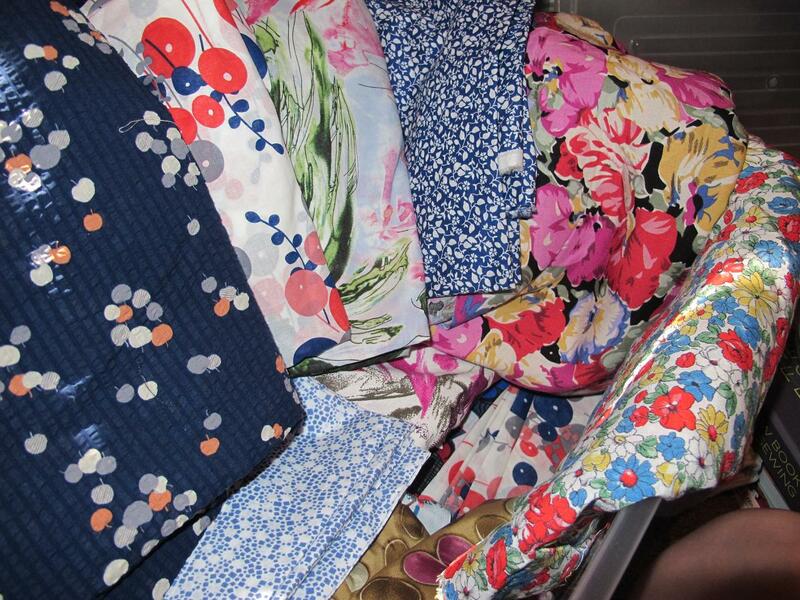 The lovely Ginger from GingerMakes kindly showed Kat the extent of her fabric collections over the weekend. I love seeing how everyone stores their stuff, although it has made me book a trip to Ikea with the husband this weekend, I think I should be taking better stock of what I have! I wonder if any of these reveals have made any of you think about how you store and keep track of your patterns and fabric. 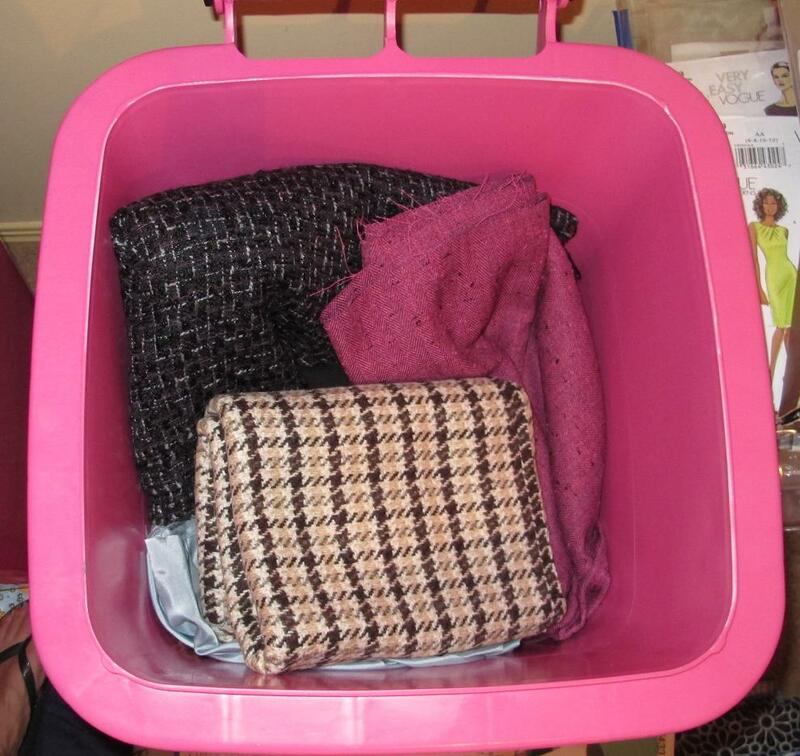 Rachel and Pia use computer programmes, Kat lists the contents of her boxes & suitcases…. So for today’s sneeky peek into the stashing habits of a sewist, I give you SewBusyLizzy! 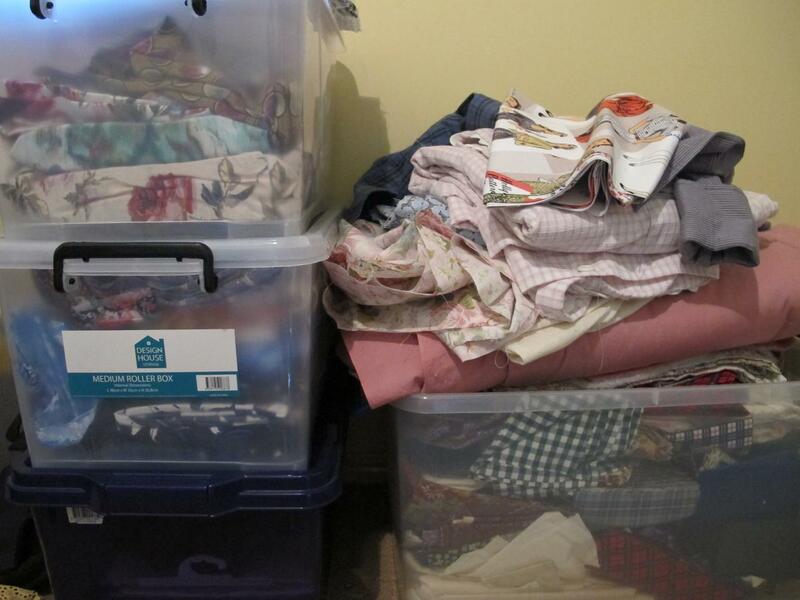 I’ve been sewing over 15 years – however is was largely patchwork sewing for a long long time. So I have a patchwork fabric stash (that I’m not sure what to do with!) and a fairly new dressmaking stash. I am lucky enough to have a sewing room – my guests are unlucky enough to have lost the guest bed… I came to the sensible conclusion that I sew every week, visitors only appear every few months! Our house is for us to live in so I decided it was more important for me to have a sewing space than a guest bedroom. The children now have trundle beds to accommodate any strays that might need to sleep over at my house. 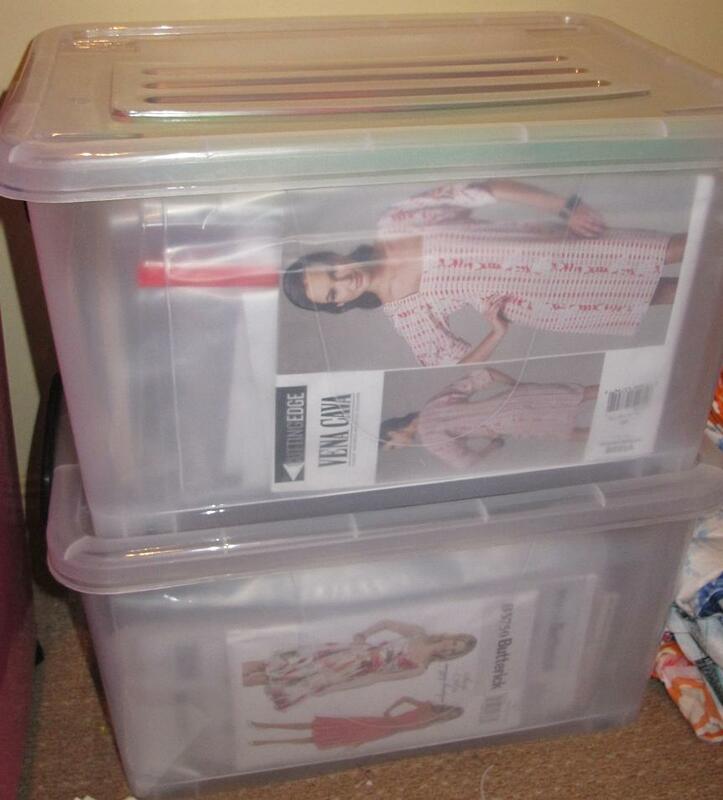 I have a couple of tubs, two mini sulo bins and an antique wardrobe that houses my two stashes. 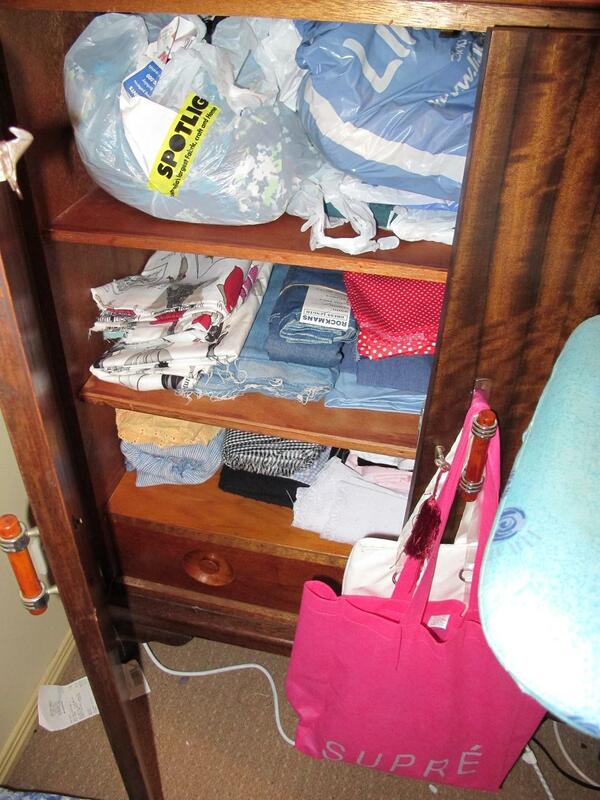 I’ve started to categorise the stash into piles of fabric based on types/weight/drape. 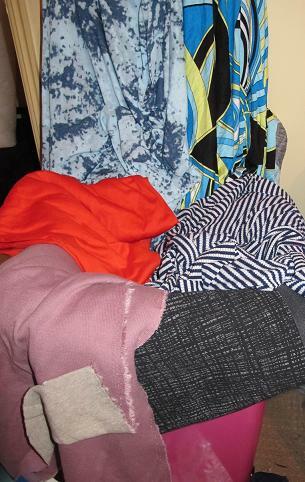 So my lawns and voiles live together, sateens are happily coexisting in their tub, my knits appear to be breeding in their sulo bin, office fabrics (ie boring and sensible types) and I have a pile of fabrics which are ‘muslin’ candidates. What is the oldest piece in your stash? What was your original plan for this piece, and why hasn’t it happened? Hmmm, for dressmaking I don’t really have a particularly old piece as I’ve only been sewing for over a year. 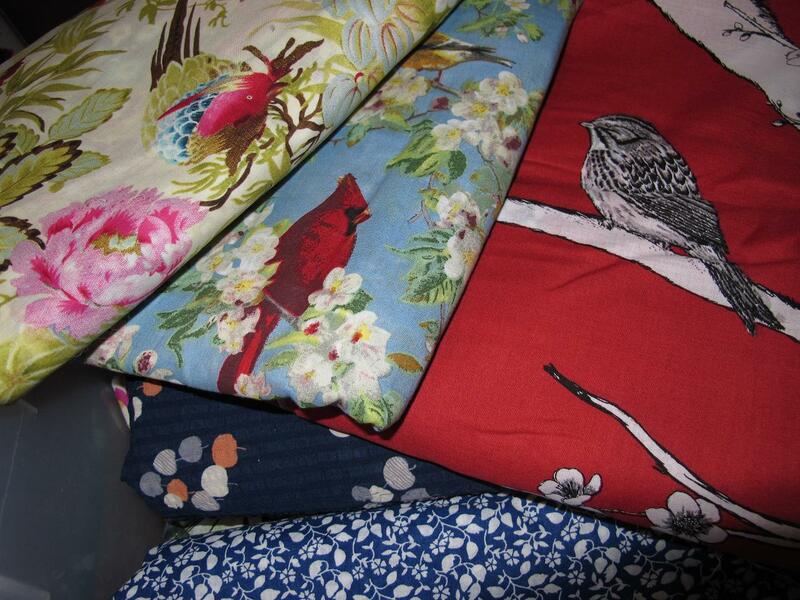 I do have lots of old pieces of fabric that I have picked up in op/charity stores. I estimate a couple of those pieces to be at least 20+ years old! It’s time for them to meet their destiny! I think it’s important to use even the bits you love. Over time our tastes change and we should enjoy our precious things while we still love them. At the moment I have a mad crush on a piece of emerald wool crepe that I got at an op shop for $2. It’s 1.5m in length and is New Zealand merino. It’s a divine rich shade and it’s just been announced as the colour of 2013! It’s going to be a pencil skirt – paired with a black lace blouse and heels it is going to be gorgeous (I hope)!! Discovering the By Hand London pencil skirt sealed the fate of this fabric. 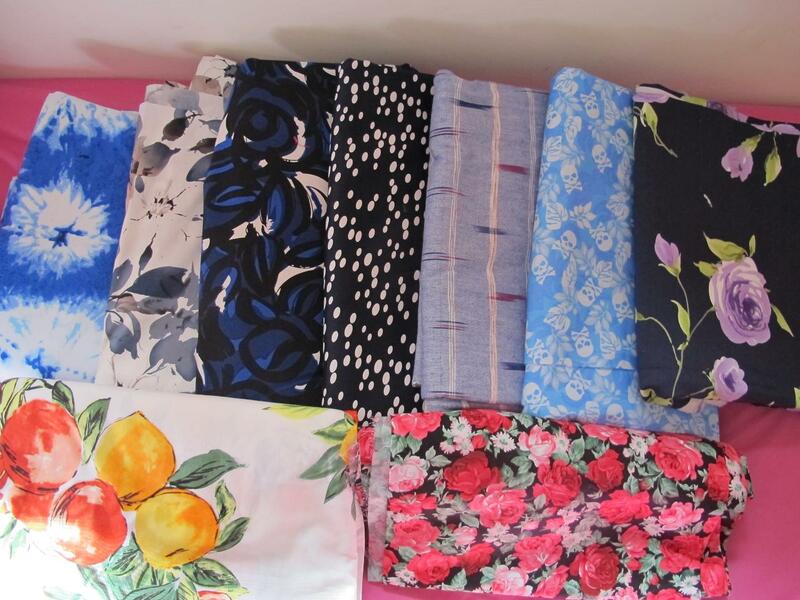 I have many cotton sateens I adore. At some point they will become dresses or skirts. It usually gets stashed and then washed as required. I really should wash first but I tend to wash when I don’t have a glut of family washing to deal with! Such pretty patterns and colours. I thought it would be hard to cut into the lovely emerald green crepe and it only cost me $2! Simply because it is lovely and even though it was very cheap, it’s still great quality and I hate to waste things! I suspect that it will be hard to cut into my black/purple wool jacket fabric – it was a gift but it is expensive fabric. I think when people gift you fabric and patterns they carry with them a weight of expectation, it adds a bit of pressure! I’m also deeply in love with a length of cotton sateen that GingerMakes sent me at Christmas – it’s a deep navy with mauve/purple flowers – just gorgeous. I can’t wait to wear it, I can’t bear to cut it – but I will as what’s the point otherwise! I’m also a pattern stasher. Patterns and fabrics are my weakness. Not notions. I’m not much into frippery and frills so I am less inclination to buy laces, trims and whatnot. I didn’t formally enter into a ‘stash-busting’ pledge. I love what Cation Designs is doing, however my life is full of personal and work commitments and that’s enough. Mentally I am committed to using more of my stash this year. I’m already seeing a drop in my purchases of floral fabrics and I’m resisting more rolls on the bargain table. I’m not sure this will continue on my London trip though! Thanks for answering our questions Lizzy, I just love those birdie prints! I wish you all the best for resisting buying fabric in London though… Maybe you could consider bringing an extra bag?? 😉 If you are in the UK and would like to meet Lizzy (and a fair few other bloggers), Rachel is hosting a meet-up. Pop over to her blog and read all about it! The stash swap is continuing, there are still lots of patterns and fabric pieces available on the Pinterest board. If you have already signed up and have arranged a swap, make sure you get it posted before the end of the month. For more guidelines, etc, check out Kat’s fab Guidelines page. Oh I’m leaving plenty of space in my luggage! Lizzy’s comment about the infrequent guests losing a room makes me laugh. I’m in the process of doing basically the same thing at my fiance’s house. Anyway, I just wanted to stop by and let you know that the fabric arrived in the mail today! Thanks! I got yours sent out this morning, so hopefully you’ll receive it before too long. I’m glad it got there safe & sound! I know! Those birds are calling my name…. Ooh, there’s some cute fabric in there! And I only learnt recently that Lizzy quilts! Its great to see others who have ditched the spare bed and made the room exclusively for sewing (etc). Me too…… and the built in wardrobe is now all mine :-). I don’t feel so guilty now. Probably should get some trundle beds though. That’s a very good idea. hehe, I wish I could steal the spare room, but Husband has already done that for himself! Damn! Hmmm, the kitchen and bathrooms are necessary …. I think a kimono robe would be great for the red bird, what did you have in mind! Gorgeous. I hope you show us when you finally make something up!